Brewer Description: (from can) The addition of raisins, cinnamon and milk sugar to our full-bodied and chocolatey Brown Ale base creates a unique beer that tastes exactly like it was pulled out of Grandma’s oven. Intro: A 12 fl. oz. can, canned on 15th May 2018. 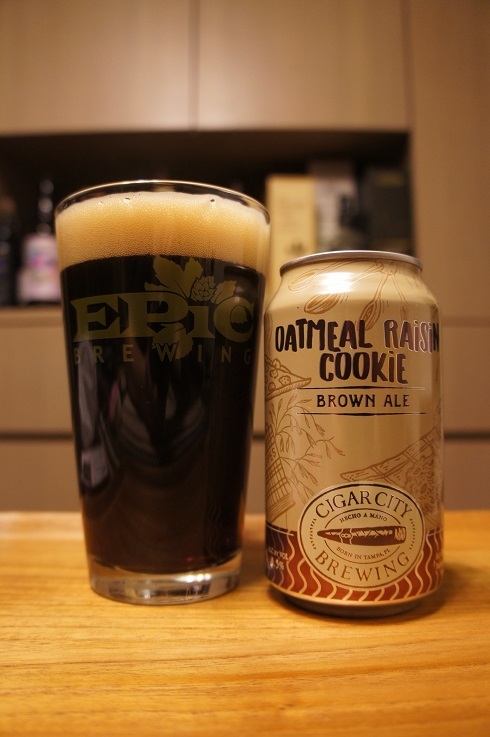 Poured into an Epic Brewing pint glass. Appearance: A clear dark brown colour with a slight red hue and a slightly more than one finger foamy tanned head that dissipated fairly quickly to a lasting thin cap while leaving some sparse lacing. Aroma: Strong cinnamon and raisin followed by caramel, chocolate, brown sugar, cream with light biscuit and toasted oats. Taste: Cinnamon, raisin, chocolate, brown sugar, cream, vanilla with some light caramel and toasted bread. Mouthfeel: Light bodied with moderate to low carbonation. Overall: Cinnamon was a bit too strong for me and body was probably on the light side, but raisins and chocolate still is a good combination. 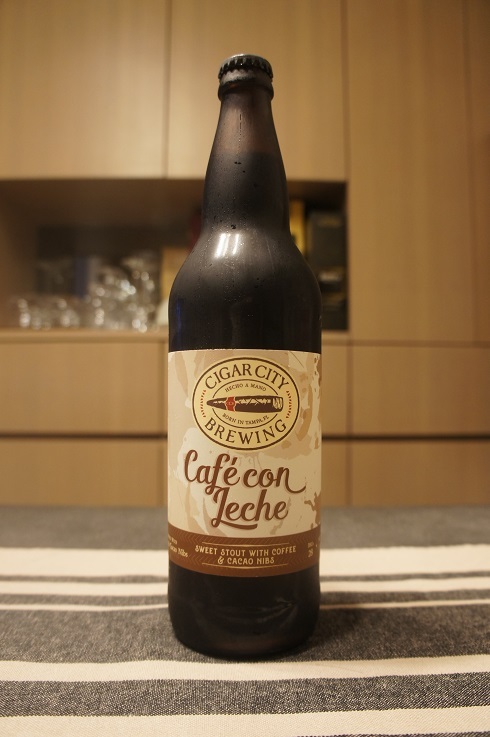 Brewer Description: (from bottle) This beer is made with bold, strong coffee beans to emulate the most characterful Cuban espresso and lactose, a milk sugar that adds sweetness, body and flavors reminiscent of scalded milk. We’ve also added cacao nibs to further enhance its satisfying chocolate quality. Despite its assertive flavors and full body, our Sweet Stout is deceptively low in alcohol, making it the perfect accompaniment to a late-morning plate of eggs, bacon and tostadas. Intro: A 22 fl. oz. bomber, bottled on 10th November 2017. Poured into a Lost Abbey teku glass. Appearance: Dark dark brown in colour with a two finger brown head that had good retention and left some nice lacing. 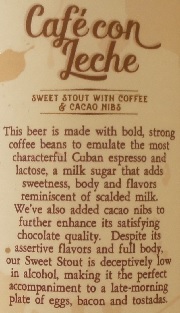 Aroma: Coffee, chocolate, cacao, roasted malts with hints of vanilla and cream. 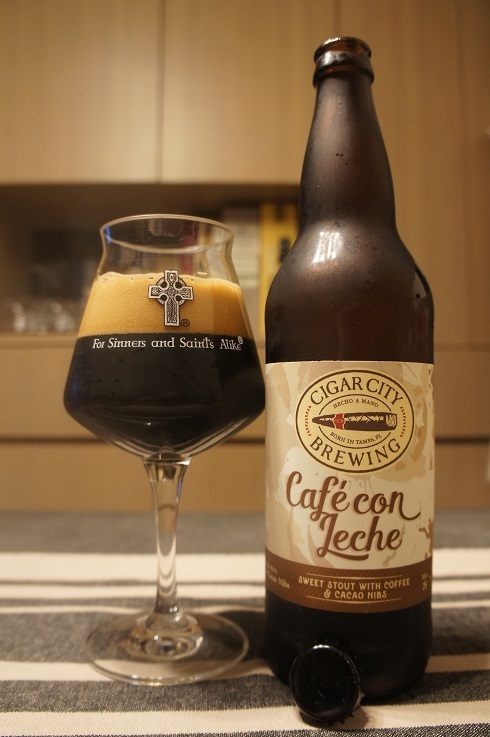 Taste: Chocolate, coffee, cacao, cream and vanilla with a light herbal element on the finish. Overall: A very nice and easy drinking Sweet Stout that is creamy, smooth and has great coffee flavours. 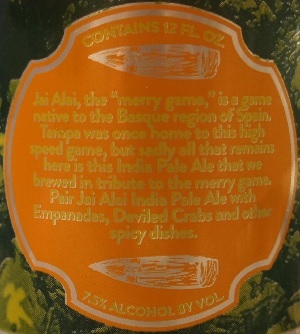 Brewer Description: (from can) Jai Alai, the “merry game,” is a game native to the Basque region of Spain. 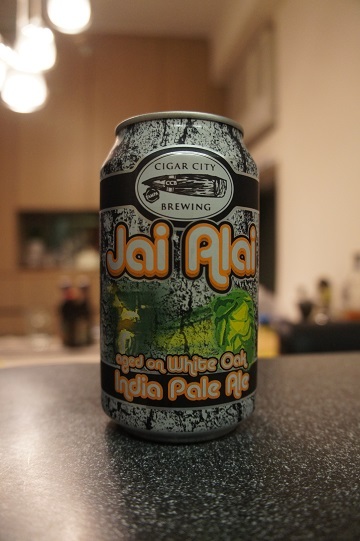 Tampa was once home to this high speed game, but sadly all that remains here is this India Pale Ale that we brewed in tribute to the merry game. 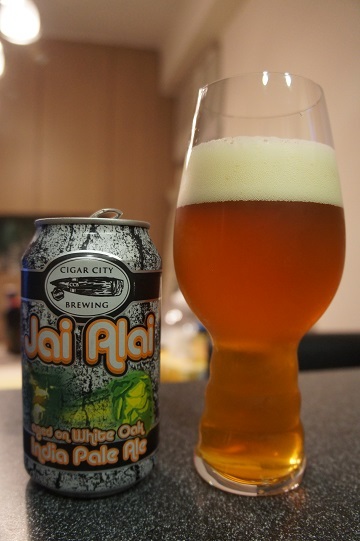 Pair Jai Alai India Pale Ale with Empanadas, Deviled Crabs and other spicy dishes. Intro: A 12 fl oz can with a canned on date of 21st March 2017. Poured into a Lost Abbey teku glass. Appearance: A slightly hazy light copper orange colour with a two finger slightly off white head that had great retention and left lots of nice lacing. Aroma: Lots of citrus grapefruit peel, orange rind and lemon with hints of tropical pineapple and pine. Taste: A nice sweet-ish malty caramel and biscuit backbone, followed by some nice citrus grapefruit and orange with a touch of pineapple and a mildly bitter finish. Overall: To be fair, perhaps this was hidden in my fridge a bit too long. It was however, still well balanced and enjoyable to drink. 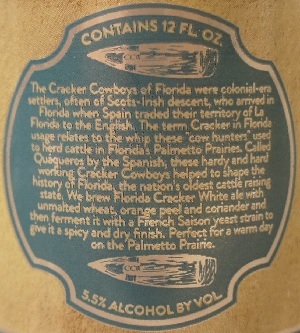 Brewer Description: (from can) The Cracker Cowboys of Florida were colonial-era settlers, often of Scots-Irish descent, who arrived in Florida when Spain traded their territory of La Florida to the English. The term Cracker in Florida usage relates to the whip these “cow hunters” used to herd cattle in Florida’s Palmetto Prairies. Called Quaqueros by the Spanish, these hardy and hard working Cracker Cowboys helped to shape the history of Florida, the nation’s oldest cattle raising state. 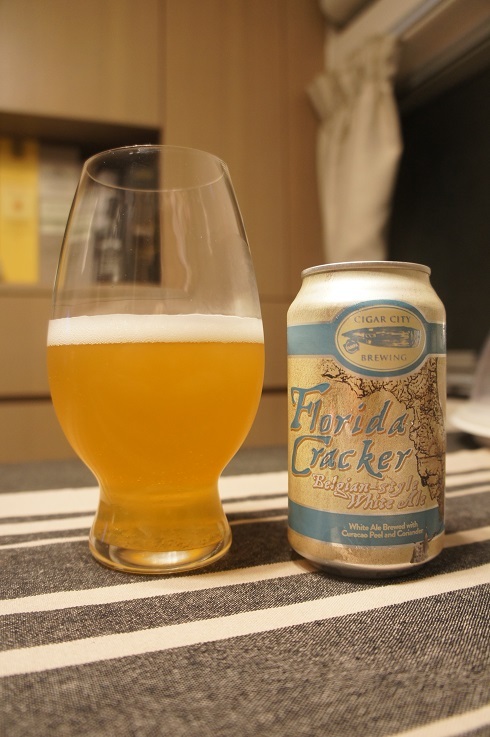 We brew Florida Cracker White Ale with unmalted wheat, orange peel and coriander and then ferment it with a French Saison yeast strain to give it a spicy and dry finish. Perfect for a warm day on the Palmetto Prairie. Intro: A 12 fl oz can with a canned on date of 7th September 2016. Poured into a Spiegelau Wheat Ale glass. Appearance: A slightly hazy golden straw yellow colour with a one finger white head that dissipated fairly quickly and left some sparse spotty lacing. Aroma: Wheat, coriander, clove and overripe banana sweetness with a hint of citrus peel. Taste: Coriander and wheat upfront with a touch of lemon citrusness. However after that, the taste just suddenly falls off to almost nothing. Mouthfeel: Dry-ish, light bodied with moderate carbonation. 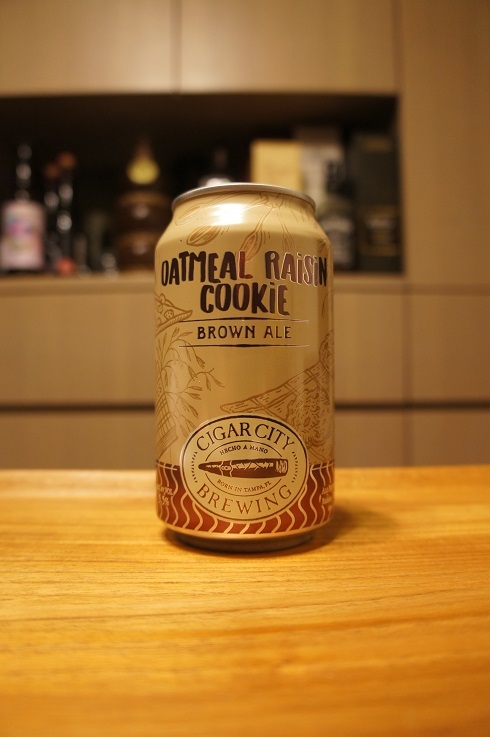 Overall: It was certainly refreshing and quite nice when it first hits your mouth, but after that, I felt that its main problem appeared which was that the taste just falls off really quickly to nothing after the initial hit. 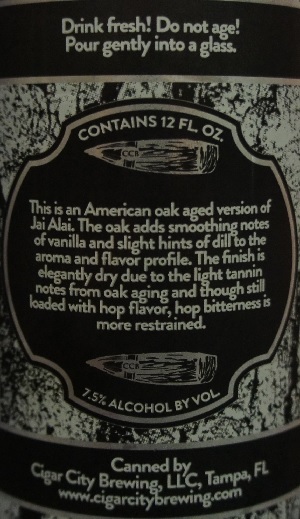 Brewer Description: (from can) This is an American oak aged version of Jai Alai. The oak adds smoothing notes of vanilla and slight hints of dill to the aroma and flavour profile. The finish is elegantly dry due to the light tannin notes from oak aging and though still loaded with hop flavour, hop bitterness is more restrained. 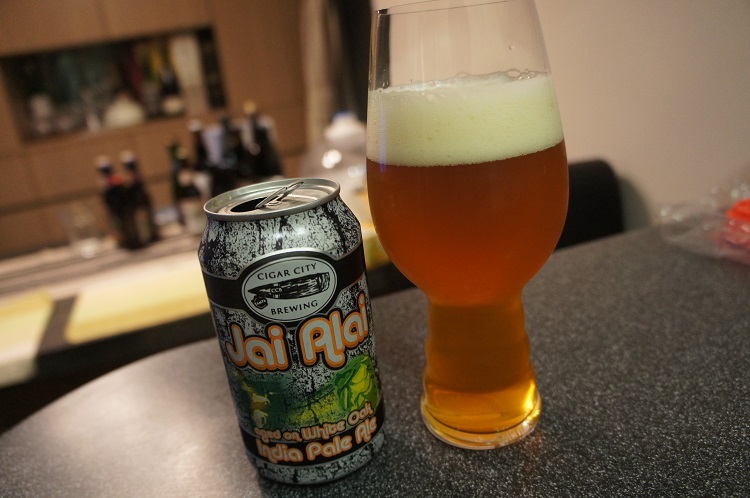 Intro: A 12 fl oz can with a canned on date of 17th November 2015 and poured into a Spiegelau IPA glass. Appearance: It poured a clear golden orange colour with a two finger white head with lots of stringy lacing. Aroma: Tropical mango, pineapple and peach with some citrus grapefruit followed by hints of vanilla and dill. 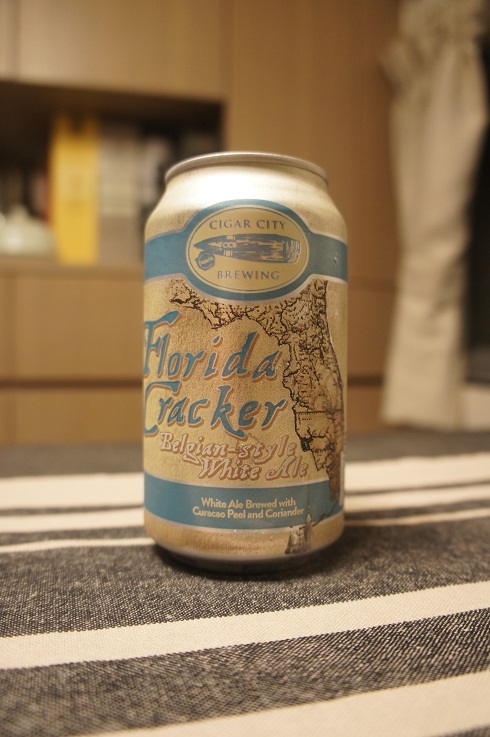 Taste: Strong vanilla and oak upfront with mango and peach supporting and hints of grapefruit. Mouthfeel: Dry, medium bodied with light carbonation. 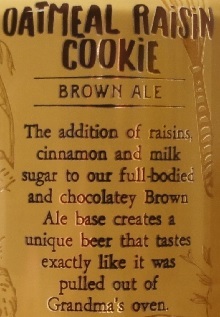 Overall: I have not tried the original base IPA yet as I haven’t been able to get my hands on any. However, although this is not the first barrel aged IPA that I’ve tried, I haven’t tasted any beer like this one before. 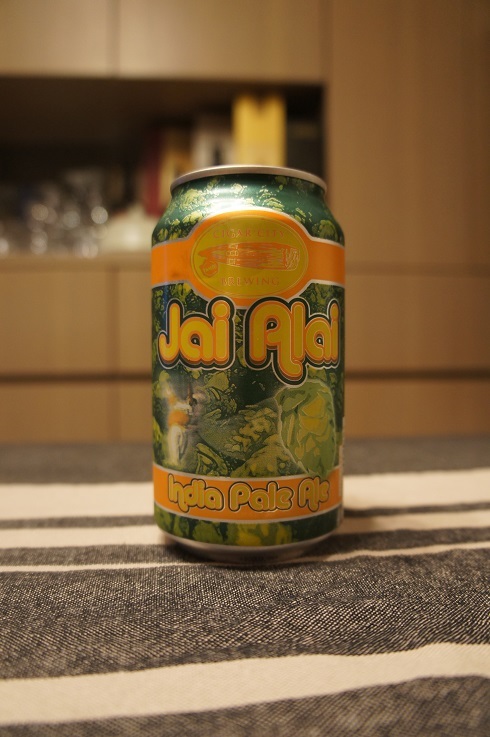 The tropical fruit taste mixed with vanilla was interesting and a refreshing change.